Brian and I arrived in Sleaford bright and early, with the day looking promisingly bright. Phil and Rowan arrived shortly afterwards and, with bikes assembled, we headed north out of the town for our first stop. Actually, we started off by heading south out of the car park, crossing the River Slea on a concrete slab, because Sleaford’s one-way system was working against us at this point. We then inserted ourselves into said one-way system, heading the right way and passing a scattered collection of parked police vehicles before taking the Connect-2 path over the A17 and up to Leasingham. This path, complete with blessedly traffic-free bridge, was opened only last September so we definitely timed our first Sleaford ride well. We’re still not sure why there were police vehicles scattered over northern Sleaford though. Following a coffee-and-cake stop at a very nice garden centre in Ruskington (we had travelled all the way up from Northamptonshire before we got started) we set out across the flattish lands of central Lincolnshire, passing the old airfield at Metheringham, discovering a tarmaced (and well-used) Bridleway in Dunston, and visiting the “Dandelion Clock” in the exquisite little village of Nocton. We also benefitted from National Rail’s policy of closing level crossings wherever possible – we had about 3 miles of tarmac with a level crossing in the middle that could be used only by pedestrians and cyclists. 3 miles with virtually no chance of anything motorised being on the road. Having said that, the lanes from Sleaford to Lincoln were all pretty light on traffic, the only busy-ish section being a bit of B-Road that we travelled on and which wouldn’t have been considered busy in Northamptonshire. We cut down to the Sustrans path (yet again, tarmac!) along the river Witham a few miles east of Lincoln and trundled along to the edge of the centre. Due to a strange combination of pedestrianised areas, dual-carriageways and one-way systems, Lincoln is not a simple place to find one’s way around. Beautiful, but confusing. 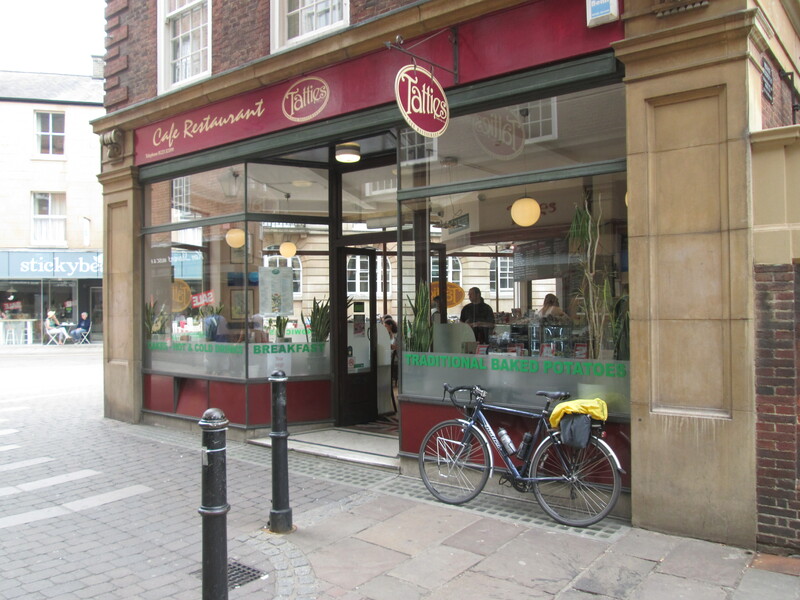 So it took us some time to lock the bikes up and make our lunch stop – Stokes Coffee Shop on High Bridge. And it is on the bridge, right over the River Witham. I do believe Mr Gray relieved them of their sole remaining sample of local beer while we there – hope they restock before anybody else goes. After lunch, and more wandering around to retrieve our bikes from their various locations, we had to attempt the climb up to the cathedral, cobbles and all. Three of the group made it – I won’t say who resorted to walking. Having marvelled at the cathedral awhile, we made our way back down the hill, on tarmac this time, and left Lincoln on what is probably the most infuriating cycle path I’ve used in some time. Not only did it, confusingly but usefully, go across the centre of a roundabout, it stopped at every side turning into retail parks, car parks, petrol stations – some of which had slipped access from the dual carriageway so cars weren’t expecting even to slow down that much as they turned. There was plenty of space on that road for a proper cycle lane which wouldn’t have ceded priority to turning or joining traffic. Later on, the surface went from tarmac to paving slab, just to add insult to injury. Rowan and Phil disappeared into a large house at this point, and returned a few minutes later brandishing a set of mudguards to fix to Rowan’s bike. How fortunate we’d not needed them thus far – that would change! Back on the road (using a proper cycle lane and not a painted bit of sidewalk) we headed away from the urban area altogether and back out into the countryside, noticing the wind properly for the first time. We trecked along the low-lying land south of Lincoln before turning east towards the escarpment and the village of Boothby Graffoe. While heading eastwards, we took to watching a small storm over to our right, some miles away but heading towards us. We figured that if we got up the hill, made a right turn onto the main road and got going, it would probably miss us. The climb up the escarpment was, again, noticeably steep but we all managed to stay on the bike for this one and we had a lovely view of the approaching storm as we made our way through the village. Satisfied that we wouldn’t get wet, we were somewhat surprised when two minutes later it started raining. We bolted for the shelter of some trees in front of a gated driveway and stayed there for a good ten minutes putting on water proofs and watching our part of the world getting considerably wetter. It stopped about two minutes after we set off again and a few miles down the road it looked like they’d escaped the downpour altogether. We would have missed it had we been quicker! That was all the rain we saw during the ride. We tracked back towards Leasingham using a combination of very quiet lanes and a brief stint on the A15 before heading back into Sleaford on the Connect-2 path we’d left on. The track of the route (from the morning coffee-stop on) is here:http://www.endomondo.com/workouts/222422170/5180977. Don’t believe the numbers – the pause function doesn’t seem to be working too well and I’m sure I didn’t hit 47 mph. I think I’d remember if I did! Thanks to Rowan and Phil for planning this one, and I’d recommend Lincoln for a day out, or Lincolnshire for a day’s riding, to anyone. Everyone we met seemed to be cheerful and helpful to boot! This Sunday CTC Northampton rides to the beautiful city of Lincoln. The route is flat or slightly rolling – with the notable exception of Lincoln itself. The route contains a number of points of interest, from villages with historical connections to a WW2 airfield – and the magnificence of Lincoln Cathedral! Gentle gradients – apart from one! There will be a chance for a brief look in the magnificent Cathedral. Lunch will be in the Cathedral refectory or nearby. We will take a good cycle path out of town through the Hykehams, then cross the rather flat Witham valley through Bassingham and Navenby and eventually back to Sleaford. We hope to see you on Sunday. Final details to follow. 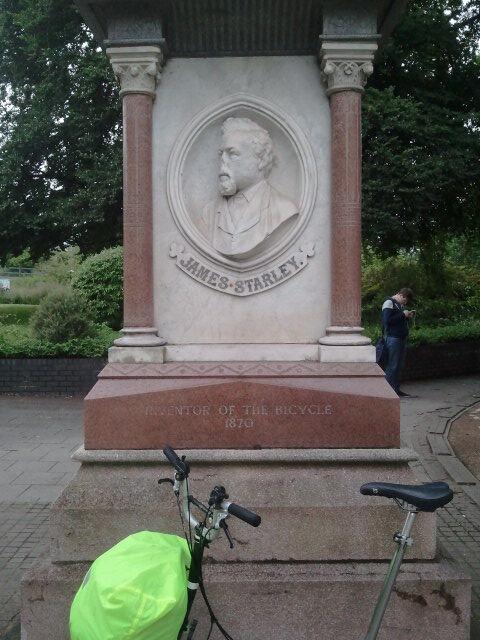 the statue is indeed that of James Starley, inventor of the modern bicycle, and it’s located in his home city of Coventry, in Greyfriars Park between the station and the city centre. It seems I owe Ian Macsporran a cup of tea, and I’ll have to think of something trickier for next time! On the day the Tour de France covered the same route as this years Etape (successfully completed by our own member Philip Gray two weeks ago) Alex had lined up a hilly route for a brisk morning ride. The challenge was 2600ft and 35 miles. At the end Alex extended the route to just complete a total of 3000ft of ascent according to his GPS logger. A mere trifle compared with real Etape I suspect. Six riders, including a new CTC member Terry, set out from the Brampton Valley Way / Welford Road meeting place at 9.30 a.m. in cloudy and cool conditions. This lasted throughout the ride and made for very pleasant cycling compared with the previous few days, although potentially the forecast was hot. The route took us through Holdenby, Spratton and Brixworth in a series of undulations to Cottesbrooke where we had a brief spell on the flat before the long climb up to Haselbach. Then we pedalled a short stretch to Nasby before turning down to Clipston and then to Kelmarsh. A slight problem was a sign that the road to Kelmarsh was closed over the weekend but we pressed on to find that the reason was a major event at Kelmarsh Hall with a one way system for traffic to its car park. Luckily we were able to walk the short stretch to the A508 and cross to Arthingworth. More hills followed in a loop to Harrington on some very pleasant narrow roads. Whilst we were bidding farewell to Iain – he left to pedal to Kettering – an elderly gentleman cyclist passed us on his way to a wedding (not his) in Harrington. A drop into Draughton and then up to Lamport Hall before more gentle undulations through Old and Hannington and then the final few hills and a short detour to complete 3000ft of ascent before ending at Moulton. We arrived at the J Gallery Café in the village at 12.30 p.m. for a welcome cup of tea in the gardens. 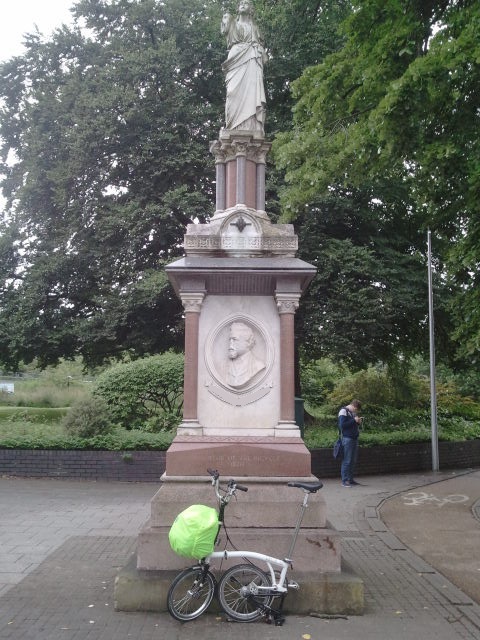 Alex’s Bianchi kit was much admired by the other customers who were cycling-friendly. Many thanks to Alex for planning and leading a very pleasant ride through quiet picturesque Northamptonshire lanes. A route definitely to be recommended. “Guy Barber” Ride – Well done, David! David writes: I started out early – 6.20 a.m. from the Canoe Centre, Northampton – and arrived in St Neots at 8.45 a.m. for a sandwich and drink before heading on to Cambridge. There was a mist in the sky that stopped the sun warming the morning up too much and the breeze created by cycling helped to cool me. 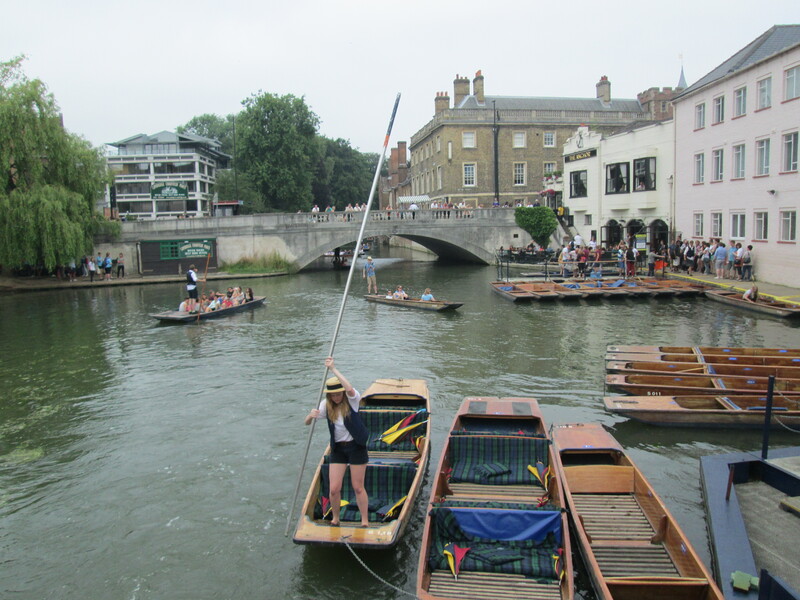 I arrived in Cambridge at 10.35 a.m. and wandered around the centre looking at the colleges, the punting and the market stalls. I had tea and cake at Tatties Café before starting my way back home through the crowds of tourists around 1.30 p.m. I returned to St Neots at 3.00 p.m. and chose to continue on a route which was slightly different from the way I’d come in the morning. It was one of the hottest days of the year and I eventually arrived back at 7.30pm. Although I did not have a cycle computer to measure my distance, Bill (the organiser of the “Guy Barber” Ride) has confirmed I have done my first 100-miler. We start at the Brampton Valley Way – BVW or National Cycle Route 6 (Welford Road Crossing, near The Windhover) at 9.30 a.m. Distance = 36 miles. Pace = brisk (say, 14 m.p.h average). Finish at The J Gallery Café, Moulton. Alex will be leading and he has worked out a route with 2,536 ft of ascent! His contact number is 07710 911158. He looks forward to seeing you. Alex notes that at the moment the BVW is signposted “closed” for 12 weeks between Mill Lane and the Welford Road Crossing but he has been using it OK from the “horse field” at Kingsthorpe. After the ride, you could pedal on to Karen’s Coffee Day at 33 Grange Road, Stanwick, NN9 6PZ. CTC member Karen rode from London to Paris in aid of “Against Breast Cancer” in June this year; in June next year she’s tackling the Three Cities Ride (London to Brussels to Amsterdam). On Saturday she’s holding a Coffee Day (10.00 a.m. to 4.00 p.m. – not just a Coffee Morning!) as part of her fund-raising for “Prostate Cancer UK”. There’ll be cakes and other refreshments – and a tom bola / raffle. Karen would love it if you could call in and support her! 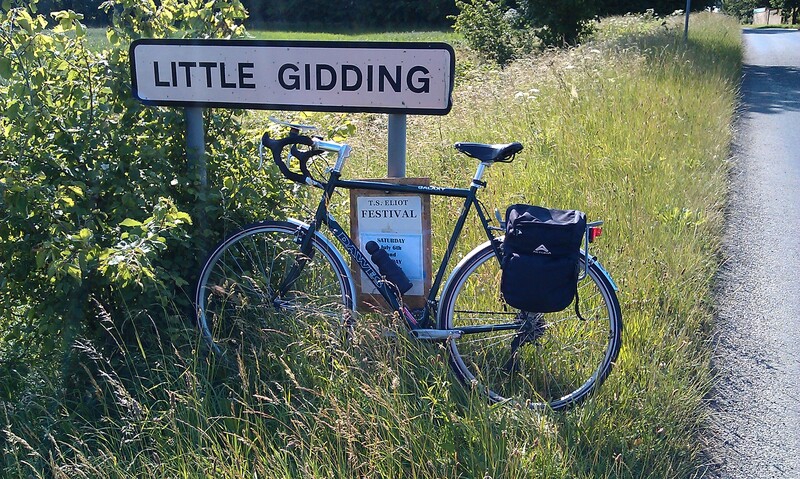 Then the high point for me of the route: pedalling through Little Gidding, the hamlet that gives its name to the title of the fourth of T S Eliot’s great last set of poetry, “Four Quartets”. And there was the smallest of boards advertising an Eliot Festival over the weekend, presumably at the house associated with the seventeenth-century Anglican community established by Nicholas Ferrar.